Last night we wasted our evening by watching the horrible Woody Allen “thriller” Match Point which we borrowed from the library. We may never get those 2 hours back, but at least we had some delicious dinner settling in our bellies. Dinner was a fish dish so full of savory flavour that throughout the meal was complete and utter silence. Even Cornelius didn’t mind digging around the olives because everything was so tasty. Normally, I cook fish either in an Asian style with soy sauce and ginger or panfried with a cornmeal crust, so this was a bit different but it was simple and something I’ll definitely try again. Plus, it was a one dish meal with everything baked on a foil-lined tray for super easy clean up. As well, this meal could easily be turned into a vegetarian one dish feast by getting rid of the fish and throwing in some chunks of zucchini, yams and eggplant instead. What’s not to love? 1. Heat oven to 400 degrees. In a foil-lined walled cookie sheet, evenly line the pan with the cubed potatoes and large onion chunks. Drizzle with half of the olive oil, rosemary, salt and pepper and toss everything around with your hands to coat. Bake in oven for about 25 minutes until starting to brown. 2. On a plate, season the fish and the cherry tomatoes with salt and pepper and a bit of rosemary and coat with the remaining olive oil. Use your hands to make sure everything is covered with the oil and spice. 3. 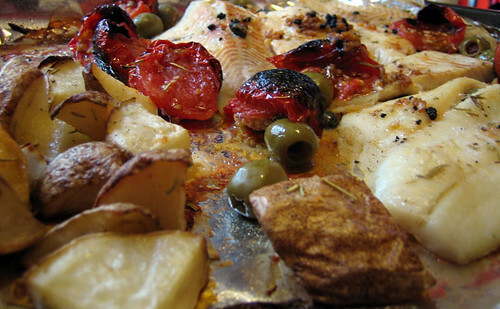 Push the potatoes to one side of the cookie sheet and place the fish and the tomatoes on the other side. Fill in remaining gaps with olives and capers. Squeeze lemon juice onto the fish and tomatoes. Return tray to oven for another 20 minutes or so, until fish is cooked and tomatoes are roasted and wrinkled. Transfer onto plates and serve. I’m totally trying this, even though I am still a fish-cooking virgin. And OH MY GOD that movie was hideous, wasn’t it? What a total waste of time. I may try this with salmon…or your idea for just a veggie delight! Thanks! You are so fortunate to be living near the Pacific Coast where you have access to all kinds of fresh underwater delights…a.k.a. fresh fish and seafood. I was in B.C. two years ago and had an awesome salmon burger at this place in Kits…it was a restaurant right on the beach…the scenery was incredible too! As a child, I was encouraged to eat all kinds of great fish and seafood but of course, I refused to eat most of it and gave my mom a hard time. Now, as an adult, I just can’t get enough of it. Your ‘fishy feast’ should be aptly named: “A King’s Feast”. maven, i totally thought you were a vegetarian! enjoy your fish devirginizing….hmmmm. and yes, i hated that movie! what’s up with all the positive reviews for that one. everyone must be brainwashed. jenn, enjoy serving the fish! even if your family just eats up the potatoes it means more for you! judy, mmmm, i think it would be pretty tasty with salmon. yes, joanne, i feel pretty lucky here on the west coast! mmmm, beth! vermouth and dill….sounds lovely. i was curious about “scoop” but now i think my love affair with woody should stay in the past. i don’t know if i could venture into any new woody territory. hag, as you well know, the library rocks! and yes, the meal was very provencial…if only we were on a sun drenched terrace instead of our livingroom. oh well! that has to be the perfect dish. I love one pan. and totally agree, match point sucked profoundly. I had to watch annie hall twice after to take the sour taste off my mouth. I did something like this not to long ago – but I used a whole lot of vermouth and dill and cooked it all in a saute pan with the lid on. It was yummy, and a great way to use up the random frozen white fish you find at the market for super cheap – and yet have no idea what to do with. And we just saw Scoop the other week, and it was really adorable. Too bad about Match Point. It sounds very provencal …very south of france. Delicious! Too bad about the movie…but at least you didn’t pay for it! That is the beauty of movies from the library. good to see another “match point” hater, lobstersquad! and i agree about the one dish dinners. so good. I am rather disappointed. The recipe looks great (I will try it out sometime this holiday weekend for us in the States). Just by a weird coincidence, we watched Matchpoint on Wed as well – and we both enjoyed it immensely! I think it’s the best Woody Allen has done in a long time. But that’s just my two cents! Happy chowing! Alice, what a coincidence on watching Matchpoint. Your opinion on Matchpoint does seem to be the majority but I just couldn’t buy it or stay interested in it. That’s okay because the world would be so boring if everyone agreed with everyone else 😉 Enjoy the long weekend! I love love love the new site!